Two weeks ago, we had an ice storm. Tonight we are in no danger of anything more threatening than rain, but on this last evening of fall, I can feel winter’s impending arrival even though I live in a climate where that ice storm could well be the only really wintry weather we get all year. When I woke up this morning, it was 66 degrees, damp, and breezy. The cool, moist air felt like a favorite aunt was giving me a lingering goodbye hug. This evening, the winter bite is back, and while the temperature has only decreased by about 30 degrees, there’s something different in the pulse of the world. This chilly, damp weather gives me migraines, sometimes, and when I get them, I get really crabby – even bitchy – but I’m also at my most creative when it’s wet outside. There’s something magical about the beach in winter. The sand is cold and clammy, and the ocean and sky seem closer akin then they do when both are sun-warmed and blue. The smell is deeper, as if something from far below the surface has come for a visit, and there are different things to find. In my dreams, Fuzzy and I walk the dogs along a winter shoreline. In my waking life, I stare at the swimming pool and grin when it’s windy enough for the water to have some chop. We keep talking about renting a beach house on the Gulf for a weekend, but we never actually do. Or maybe we won’t, and I’ll have my moments of crabbiness soothed away by my husband’s tender kisses, or the wet-and-cold-nosed greetings of the dogs. Maybe this winter I’ll find a way to channel the weather-enhanced creativity. Maybe this winter I’ll incorporate more meatless meals into our diets. 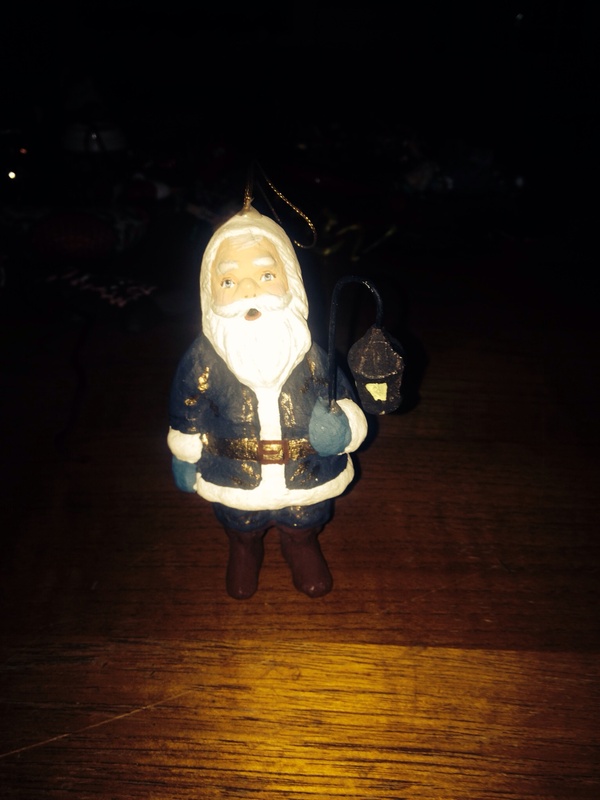 Today’s Santa: This one was a gift from my mother. He isn’t shiny or glass, but he’s one of my favorites because of the lantern he holds.